mundane jane: I don't know how much more I can take. Well, maybe just a little more. I don't know how much more I can take. Well, maybe just a little more. Good fortune looked around one day last month and decided--right out of the blue--that I was going to be her new best friend. First, there was the great new job--out by noon every day, an office less than 5 miles away from home, spending all day in the land o' liberals. But this last thing? This last, best thing absolutely takes my breath away. They put a Starbucks in the lobby of the university library. 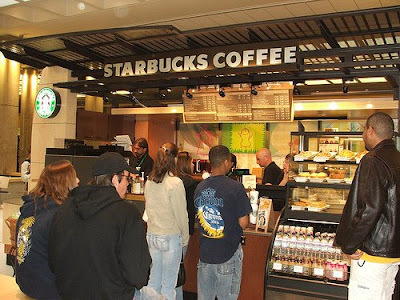 This pic is of the new Starbucks at the Sinclair Community College Library. Trust me, it looks just like ours.